Posted on Thursday, May 15th, 2014 at 2:14 pm. If you have had the pleasure of attending a wedding or an event at Palm Event Center or Casa Real, you know their cuisine is not your average wedding food. Their delectable offerings will change and exceed any expectations you had. 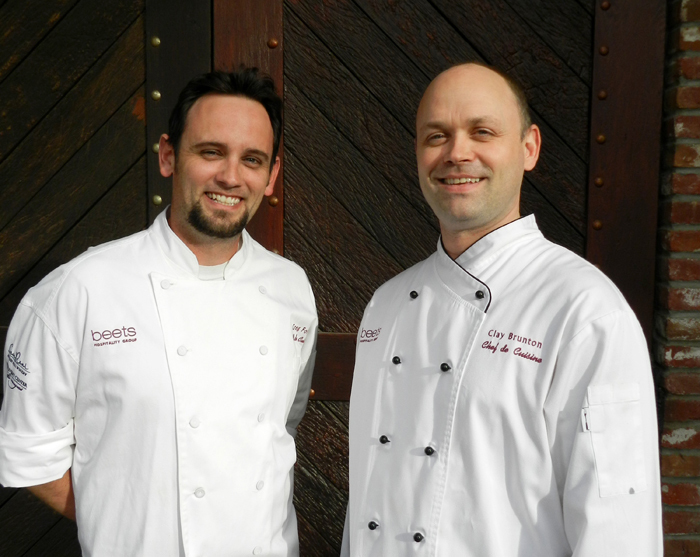 Which is exactly what veteran chefs Clay Brunton and Greg Foster intend to do. Greg who has been with Beets Catering for nine years and has been participating in Taste Our Terroir since it’s inaugural year. Three years ago Clay brought a competivite edge to the team and since then, the duo has won an award each year. Last year they won “Most Innovative Pairing”. This year, we are excited to see what they have in store with their new partners, The Steven Kent Winery. Clay: The excitement of a Saturday night with smoking hot sauté pans flying around, the knives and the fire. Now, of course it is different and more about refining techniques and exploring different cultures of cuisine. Greg: Ever since I was a kid I loved being in the kitchen with family, helping out when I could or just watching. So it has always been an interest of mine… 20 years later here I am. Clay: It is a combination of physical variables that when brought together work to create a superior product. For me it also about how a place makes me feel. Greg: Terroir to me is the relationship between the land and us. The better we treat it the better it will treat us. Being able to provide great nourishment to the land is essential to it giving us the sustenance we need. Clay: Right now. Gewürztraminer and boudin blanc, it is simple and lovely. I also like high-end champagne and fried chicken, it is an oddly delicious pairing and has shock value. Greg: I will always be content with simple steak and potatoes… so a nice rib-eye and Cabernet is perfect for me. Clay: Finding something that is new and edgy but not esoteric so that people get it and it isn’t perceived as random and thoughtless. Greg: The biggest challenge for me is coming up with pairings that no one would expect. We as a society in the last five years or so have become “foodies”. TV and social media have greatly increased our knowledge and exposure to food and wine, so coming up with something that no one has done before is what we strive for. Greg: Both. It really depends on the kind of mood I am in. Clay: The one that tastes the best and is most relaxing. Greg: The rare meal I get to sit down and enjoy with my family. With the hours we work, I am usually cooking dinner for others when I should be eating myself. Clay: My family likes turkey Bolognese, so I make that a lot. Greg: I love to make soups, something comforting about it. But in the summer, anything you can put on a grill. Clay: Auguste Escoffier in 1905. I would like to see how he did it back then. Greg: I would love to have Ferran Adria from El Bulli come and cook. Molecular gastronomy is something I would like to try. Clay: Salt, to bridge to flavor. I like to cure and smoke things and it is key to the process. Greg: Salt. You can make anything taste better with a little salt. Clay: In wine terms steely, complex and crisp.